The late ‘90s were known for a few things – blood, muscles, brutality and the fact that the newly founded Image Comics were the best at all of them. Given their dominance, it made sense that Mirage Studios would give their blessing for Image to incorporate the flourishing Turtles brand directly into the heart of their comic universe, ripe with their own creative talent and crossover opportunity. To this end, writer Gary Carlson and artist Frank Fosco gave the Turtles the ‘90s treatment in what would be called “Teenage Mutant Ninja Turtles, Volume 3”, featuring everything everybody loved about Image Comics at the time – blood, guts, cyborgs, ninjas and scantily clad women. Sadly however, it didn’t quite deliver in the way people expected. Fans were too in love with the TV version of our four turtle brothers to want them to have that ‘90s injection they were enjoying elsewhere, and the series was cancelled at issue #23, never officially released. 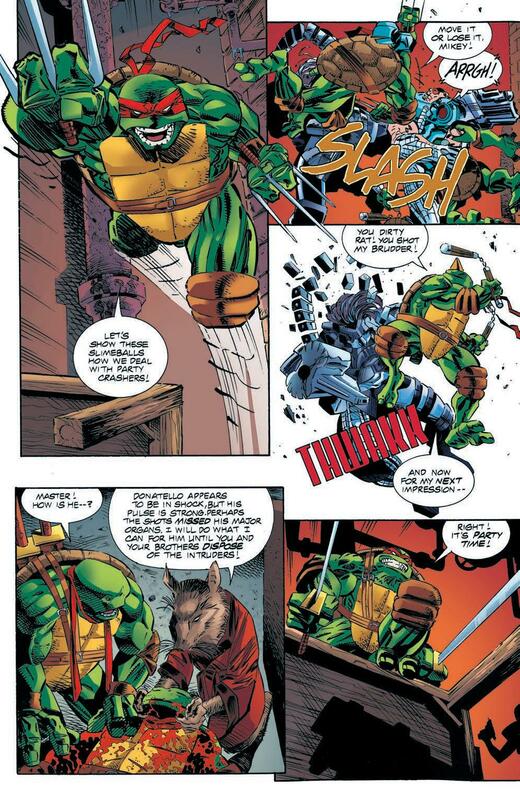 However, even though it’s still considered to be something of the black sheep of the Turtles’ line, and unknown to younger TMNT fans like me, Turtle-loving IDW are never ones to leave something unappreciated. 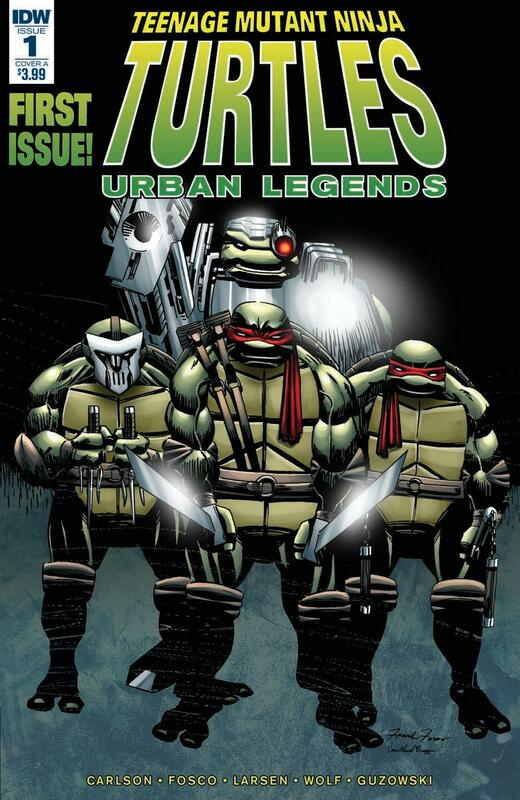 This is a roundabout way of saying that this week, IDW are bringing us Teenage Mutant Ninja Turtles: Urban Legends #1; the first issue in a full reprint of Volume 3, with new colouring and the final issues finally released in official capacity. If there’s something that’s likely to tempt you into checking out this book, it’s the “bizarre” tagline IDW puts on the back of the issue – something that shows so plainly one the cover. Donny’s a cyborg! Raph has a mask! Plus, when reading this first issue, knowing somewhat how future events unfold, Urban Legends is like a whole bunch of AUs and fanfics smooshed into one whole new continuity. It also doesn’t hurt that these wild ideas obviously come from a place of love, as Carlson has a deep appreciation for the Turtles that’s easy to see. Even in this new, darker continuity that not every fan connects with, and even while they’re all sporting the classic reds, Carlson brings all the personality and quirks you expect from the Turtles immediately, making it easy to identify with them again regardless of which continuity you’re familiar with. Unfortunately, this approach also proves to be something of a double-edged sword, turning this book into a time capsule of an era long-past instead of a timeless classic. It’s dark and edgy. ‘90s dark and edgy. And while Blood and Glory feat. the Turtles is a fun read, and the action and stakes are pumped up to 11 to keep you on your toes and going to the next page, there’s no denying that this is a fairly bare bones issue story-wise. At least for this first issue, outside of some touching family moments and looks into new status quo and power dynamics, this instalment doesn’t bring much to the table narratively outside of a darker set of the Turtles beating brains in and carving up limbs. 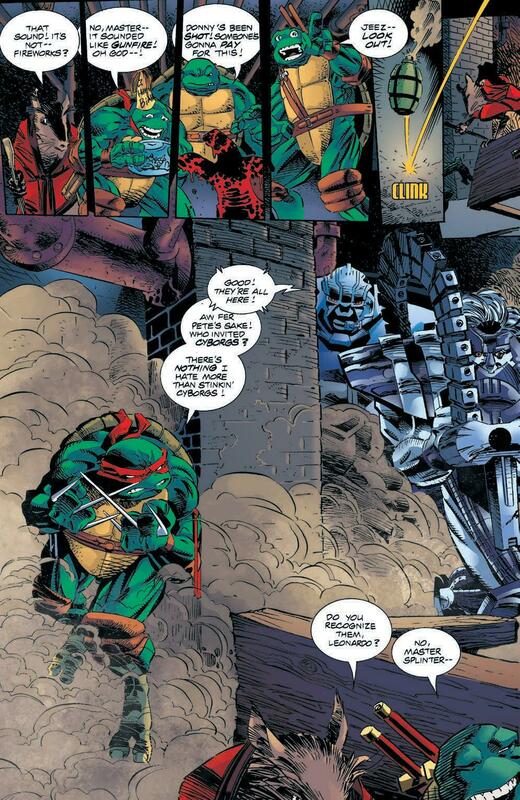 The Turtles fight, lose, have to deal with the consequences and then we await the next issue. This isn’t a comment on the series as a whole just yet of course, and I’ll be here to see if the next issues evolve into a stronger narrative. But by itself, it doesn’t blow me away, and makes me wonder if these reprints could have perhaps been packaged with two or three issues in one instead. The art by Frank Fosco definitely fares far better here. It’s a super entertaining blend of ‘90s standard bodies and the turtles own distinctive style, while also taking strong influence from the work of Frank Miller and Bill Sienkiewicz in the late ‘80s work. 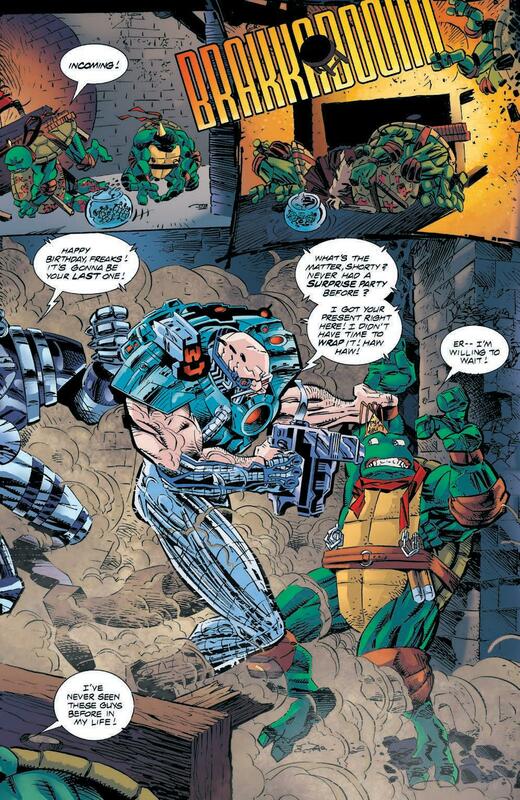 It’s a style that uses detailed linework to master high-octane action to bring the Turtles into the grungy, muscle-bounding continuity that Carlson sets up. Fosco allows that ‘NINJA’ aspect to be cranked up as swords, lasers and bodies fly everyway in kinetic action. That said, my only complaint with the art is that the linework can very easily blur in instances of over-cramped panels. 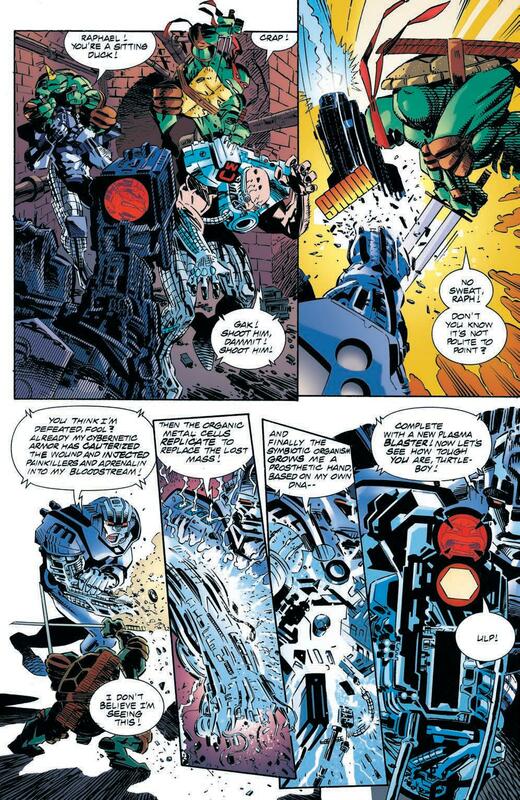 And with as many great layouts as there are, there are still panels in that second half that lack clarity. As for the colours, undoubtedly one of the big reasons existing readers would come back for Urban Legends, I’m happy to say this is one of the strongest instances of new colouring I can think of. While colourists can often poorly attempt to match older styles with newer, brighter digital colouring, Adam Guzowski brings a darker, dulled monotone four colour palette that goes pitch for pitch with the grunge and violence of this ‘90s landscape and the lean, mean, green fighting turtles. You could easily believe this was the original colouring, ripped straight from the issues. And that’s really all you could ask for, isn’t it? Teenage Mutant Ninja Turtles: Urban Legends is a fantastically coloured re-release of a mostly forgotten part of Turtles history. And while the first issue may fall flat in terms of storytelling, the familiar Turtle quips and violently fun action provide a well-drawn history lesson for new and existing readers alike about the musclebound appeal of the edgy ‘90s. Literally every word in this and most comics is capitalized. I’m confused about you comment on the word ninja being capitalized. Did you mean bolded? If so, that’s a relic from Jim Shooter being all the Image guys boss at some point. At Marvel, in the 80’s and early 90’s, certain words were ALWAYS bold. This carried over to Image comics, where characters names and certain terms that are associated with the comic were made bold to stand out. They thought of it as a way to teach new readers and to create a brand. 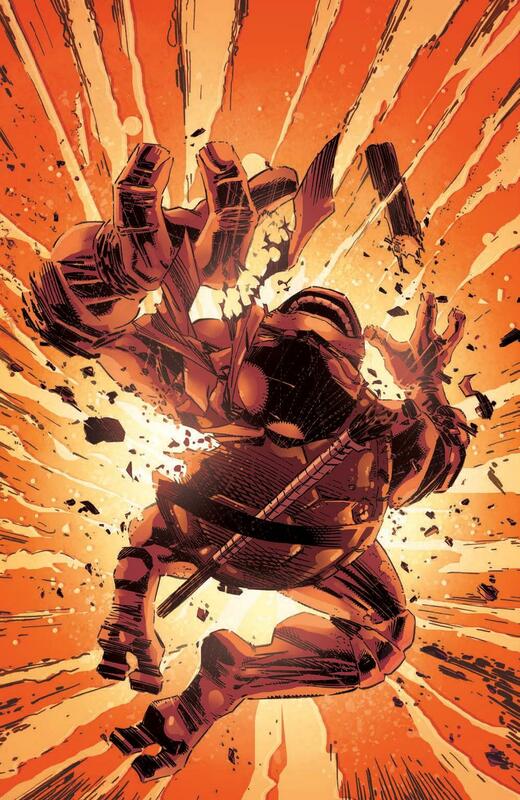 An example outside of TMNT would be the X-Men often bolding the word Mutant. Seems like something that someone that writes comic reviews should know.